This past weekend I attended a wedding – a former co-worker and friend of my husband and me. 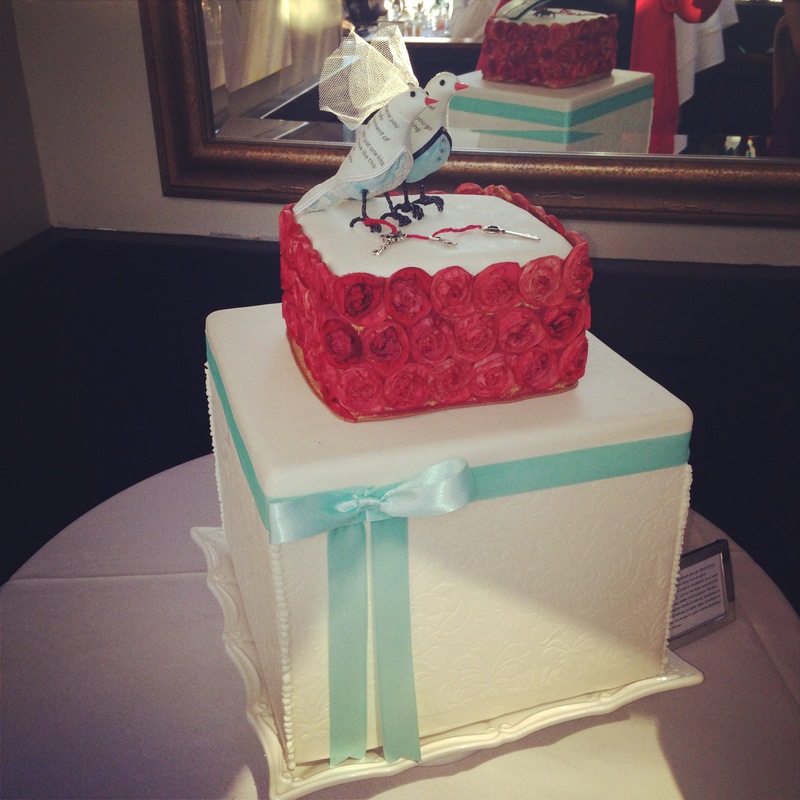 It was an intimate celebration with many sentimental and delightful touches (including this cake, made by the bride). We are going to try to have some fun with any photos you take on your mobile using Instagram. If you do not already have it, go to Instagram.com or the App Store to download and set up an account. Become familiar with taking photos and adding captions or comments. We will have a special hashtag that will allow us to share photos taken during the evening. Not familiar with it? No problem. We’ll have technical support on hand. When we arrived at the reception, we were given the hashtag to use: #GregSharon. And then we saw eventstagram. It was fantastic! I’d never heard of it before, nor had the other 5 fundraisers dining at our table; maybe you have. I immediately thought of all the past events I ran, how we set up big AV screens and showed things like logos of sponsor, the speaker, auction items or a video. What a great way to engage in what is happening NOW at the event and real-time and engaging. I leaned across the table. “Shirlyn! You could do this for the Daffodil Ball… so many opportunities for guests and supporters to share more about their evening and Canadian Cancer Society.” We nodded and watched as new pictures appeared (rotating through everything with #gregsharon, with new photos popping up as they were created). The fundraisers discussed ideas… at our own nonprofits how we could easily engage guests already on Instagram, and helping guests to use it (in the case of a nonprofit, you would need to have staff around willing to help guests get on). With events I’ve managed in the past, we often hire a photographer to take pictures of important guests and usually have a staff member accompanying that photographer to identify those VIPs and board members… with this, you could have the staff member also taking shots and posting them up on Instagram. Staff could also create some good #latergrams to post, perhaps of the work you are doing or the sponsors or beneficiaries of your work or progress being made. A guest at our table – in her 20s and with a camera lens as long as a loaf of bread – asked me how to do it. We quickly stepped through the process on her iPhone (I turned my hotspot to make her download go faster) and in no time she was shooting from her phone and excitedly seeing her images appear. My observations on eventsagram: there is a free version (they used) and paid versions. On the free version the comments you make don’t show. only the pic and the account username. And in the free version there was the occasional ad. Apparently the paid versions allow more total posts and more control (like moderating the photos) which some nonprofits my appreciate. I did not know this either, what a great idea! I’m not sure if it is new and or if it has been around and I haven’t see it… great and easy way to start being “social” in the nonprofit space.